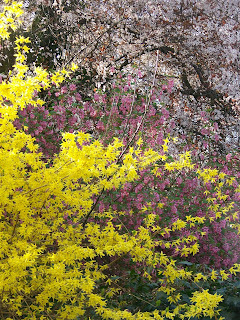 I love spring, it is possibly my second favourite season after winter. Our garden looks so lovely and bright after the greyness of the last few months, plus the sun is actually shining so I couldn't resist taking some photos. We seem to have lots of yellow flowers and then a few pink but not much else so I think I will be buying some more varied plants at the weekend. 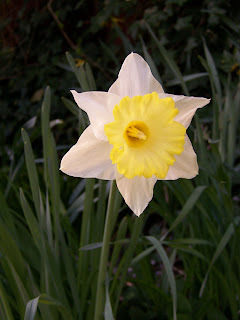 We also have every kind of daffodil I have ever seen, these are my favourite with the white outside petals. We also have the normal all yellow one, yellow with orange middles, frilly middle ones, multiply layered ones that almost look like roses and tiny weeny ones. See I know all the technical names. 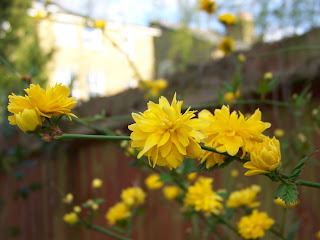 However this is my favourite plant in our garden at the moment (till my roses start coming through). I have no idea what it is, so if anyone does please let me know. The has long hard stems coming from the base with hundreds of these lovely yellow pompoms clustered around small green leaves. I know the sunshine is here when I see these flowers. So heres to more sunshine and happy days. I was hoping to grow more veggies this summer but I think I am already a little late for most of them. I think a trip to the garden centre is needed soon to see what late bloomers I can get my little mitts onto.